For a while now my sanctuary in which to write has been: Panera, Corner Bakery, the bus, and my lap. For the few years before that, the closest thing I had to a desk was a folding table. Now that I’m in the new apartment, the folding table has been downgraded to patio furniture. And now, I have desk of my very own! After a lengthy and painstaking trip to IKEA, and after finding they were all sold out of the glass desk top that I wanted, I picked my desk. This one is larger then the glass, so that’s cool. I basically found about the cheapest combination that I could. $25 top, 2 $3 legs, and splurged on a $25 shelf in place of the other two legs. Pricing was an extra win. Getting it home and putting it together was another thing. Took two trips to unload it from the car. Then I put together the shelves. Turns out, I couldn’t find my proper screwdriver, so I had to use a multi-tool that would collapse anytime I pushed too hard. Also, I didn’t have a hammer. But the legs to my new desk were heavy enough to do the trick. I discovered this after several failed attempts with other items, like a can of soup. Unfortunately, the top of the shelf got all banged up in the process. At least it’s a place that’s covered by the desk. They legs took a surprising amount of time and effort to screw on. Probably because of the inappropriate screw driver. Finally, it was done! Now I have a place where I can sit and work without my back and arms hurting. 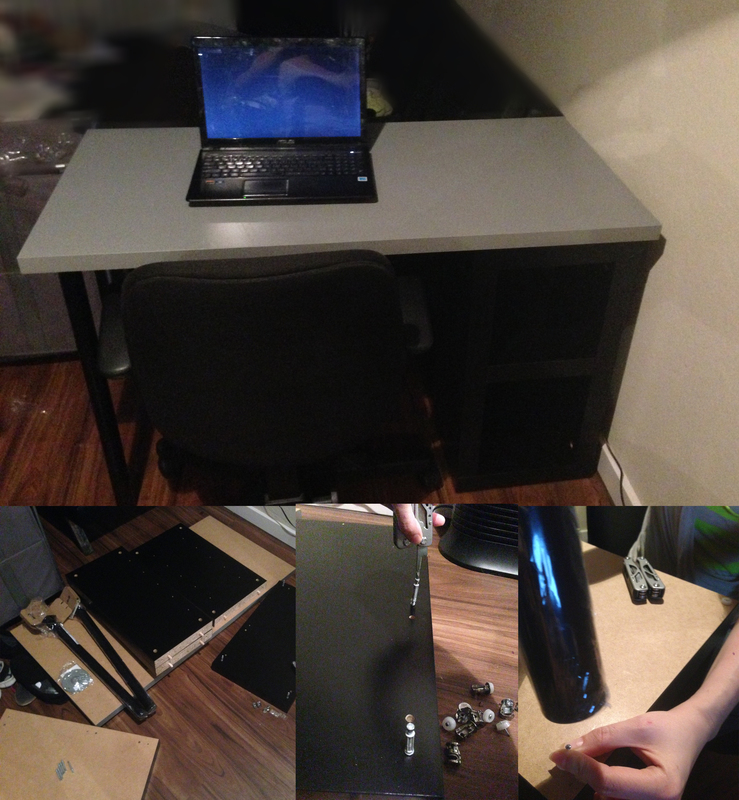 It took my sweat and tears to make this desk, but I’m pretty sure I didn’t lose any blood. I think it’s worth it to have a spot of my own.